Even though Subhash Kak et al wrote a book asserting that India is the Cradle of Civilization, still Mesopotamia is though to be the one. Now some new discoveries in Iran may change all that. Archaeological excavations in the lower layers of a cemetery in Jiroft have revealed that its history goes back to the fouth millennium B.C, much before Mesopotamia. Some inscriptions were also found which proves that the writing language of Jiroft was older than that of Mesopotamia. 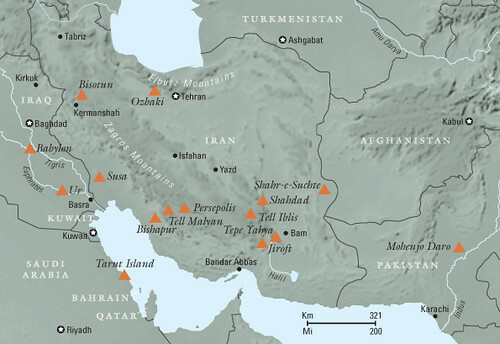 As the author of a three-volume history of Mesopotamia and a leading Iranian authority on the third millennium BC, Madjidzadeh has long hypothesized that Jiroft is the legendary land of Aratta, a “lost” Bronze Age kingdom of renown. It’s a quest that he began as a doctoral candidate at the University of Chicago, when in 1976 he published an article proposing that Aratta, which reputedly exported its magnificent crafts to Mesopotamia, was located somewhere in southeastern Iran. According to texts dating from around 2100 BC, Aratta was a gaily decorated capital with a citadel whose battlements were fashioned of green lapis lazuli and its lofty towers of bright red brick. Aratta’s artistic production was so highly regarded that about 2500 BC the Sumerian king Enmerkar sent a message to the ruler of Aratta requesting that artisans and architects be dispatched to his capital, Uruk, to build a temple to honor Inanna, the goddess of fertility and war. Few years back, Marine Archaeologist S R Rao found evidence of a city under the sea in Dwaraka and since some of the specifications matched the description of Dwaraka mentioned in Harivamsha, a prologue of Mahabharata, people thought that they had found Krishna’s Dwaraka. There is a new article which tells the details of how scientists at the NIOT (National Institute of Ocean Technology, of the Department of Ocean Development) found the submerged city while working for British Gas in the Gulf of Cambay region. Samples collected include artefacts, wood pieces, pottery materials, hearth pieces, animal bones. They ere sent to Manipur University, Oxford University, London, Institute of Earth Sciences, Hanover, Germany for analysis and dating. The results were astonishing. It was found beyond doubt that the samples belonged to a period varying from 7800 to 3000 years (BP) Before Present ! The even more flooring discovery happened soon. NIOT, which carried outside scan and sub-bottom surveys in the year 2002-03, established beyond doubt the presence of two large palaeochannels (river channels which existed once and later submerged under the sea) in the Gulf of Cambay. Alluvium samples were collected from different locations in the areas of the palaeochannels by the gravity core and grab method. Other people have suggested that Krishna’s Dwaraka was not in Jamnagar, but in Junagad and apparently there are nine sites in Gujarat which claim to be Krishna’s Dwaraka. Archaeologists excavating in Lahuradeva in Uttar Pradesh have found remains of carbonised material containing grains of cultivated rice along with wild grass dating back about 10,000 years. If this is true, then Middle Ganga Valley could be the home of the first farmers in the world. Previously it was believed that agriculture began in West Asia in a region known as the Fertile Crescent with the domestication of barley and wheat. Later a new Fertile Crescent was discovered in China where rice cultivation began much before agriculture in West Asia. In the Indian subcontinent wheat and barley cultivation began in Kachi Plain in Baluchistan(Pakistan) in the seventh millennium B.C. The findings at Lahuradeva were discussed at an International archaeology conference in Lucknow last month. But none of these theories is fully confirmed or accepted by everyone in the field, and P.C. Panth, former professor of archaeology with Benares Hindu University, pointed to just this as he made a bold claim. “It is possible that middle Ganga valley was the home of the first farmer,” he told The Telegraph. Historians who do not believe the Aryan Invasion Theory say that folks who believe in it are biased towards Europeans. Folks who believe in Aryan Invasion Theory think that others are biased towards Indians. But in this biased word of history, have you heard of people who are biased against millets? Who can be so stone-hearted to be biased against those small-seeded species of cereal grown around the world for food and fodder? Such evil people do exist and the people who do this are rice and wheat lovers. In fact, if you look at the history of millet farming you may be able to identify the period and place of the first farmer according to Steve Weber of Washington State University. A recent discovery of a grain of rice in India may prove Weber to be wrong. Excavations in Lahuradeva in Uttar Pradesh have shown that people of this region took to farming and domestication of animals about 10,000 years back. Usually archaeologists find artifcats like terracota idols, amphorae or the first labelled portaiture of Emperor Asoka. They also find old temples, forts, boats, and sometimes even skeletons. But it is only once in a blue moon that they find an entire state and this is what happened in China. Li Boqian, director of the archaeological research center of the prestigious Beijing University, said at an archaeological forum recently in Beijing that the discovery of the Western Zhou graves in Hengshui is the most important archaeological discovery since the excavation of the graves of the Marquis of Jin, another state of the Western Zhou Dynasty, in Quwo County of Shanxi Province. The newly found ancient state will help archaeologists and historians better understand the history of the Western Zhou Dynasty and its jurisdiction, Li said. More than 80 tombs have been excavated at the site in Hengshui, with the tombs of Pengbo and his wife the largest ones. The couple were buried side by side with lots of funeral objects such as bronze ware, carriages and jade, said Song Jianzhong, deputy director of the Institute of Archaeology of Shanxi Province. The stegodon was a elephant like animal that lived in Asia about 5.3 million to 1.8 million years before present. These animals were about 13 feet high, 26 feet long and had 10 feet long tusks. Stegodons were earlier considered to the ancestor of elephants and mammoths, but now they are considered to be the sister group of the mammoth and the Indian and African elephant. Recently archaeologists from the ASI (where else?) found some tools in Jharkhand’s East Singhbhum which resemble the stegodon. The deep elephant-shapped furrows stunningly resembled ‘stegodon’, the first of the true elephants that had probably roamed in this part of the world during the ‘pleistocene’ period, the official said. Chauhan said the length of the ‘elongated’ truck is very long and the about four-inch imprint point to a primitive species. “This unusual figure of an elephant on the stone at Basadera takes one back to a primitive period,” he said. In 2004, there was a spectacular archaeological discovery in Adichanallur, near Tirunelveli when 2800 years old human skeletons were found in urns. These urns also contained writing resembing early Tamil Brahmi. Later a three-tier burrial system was discovered in which earlier generations were burried in urns at 10 ft depth and recent ones above them. Soon the habitational site of the people who were burried was also discovered. Analyzing the habitational site, it was understood that people lived in a fortified town and it had a separate potters quarters. There was also evidence of industrial activity and archaeologists think that it was a crowded busy town. The analysis of these skeletons have revealed some new facts. They had Southern Mongoloid features indicating sea trade between east coast of India and south east Asia in 800 B.C.